What’s got a chewy, cakey cookie crust and a soft, sweet, and figgy filling? 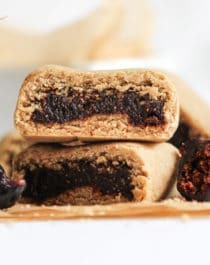 These Healthy Homemade Fig Bars of course, made with Truvia® Natural Sweetener — my favorite zero-calorie, natural sweetener (it’s made from the stevia leaf)! 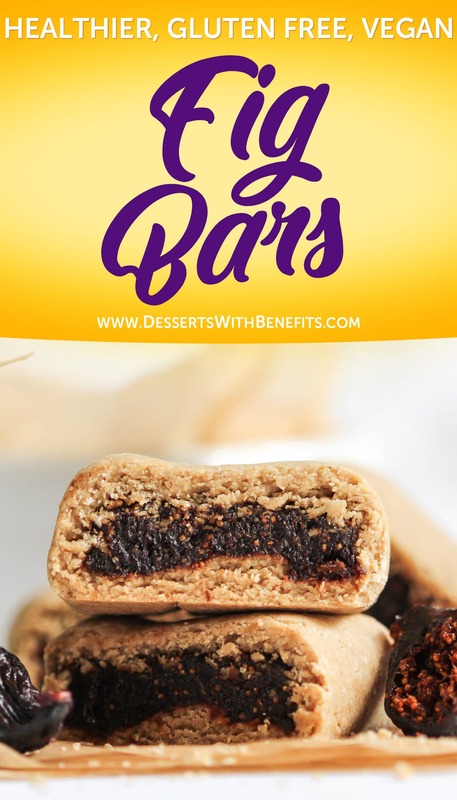 This easy Fig Bar recipe is 100% whole grain, gluten free, and vegan, with zero added sugar. Who needs store-bought when you’ve got these thick and chewy slices of heaven? No one. That’s who. Kids and adults alike will fall in love with these hearty, not-too-sweet, good-for-you treats! Thanks to Truvia for sponsoring this post, and thank YOU for supporting the brands that keep Desserts With Benefits going! All opinions are mine and mine alone! 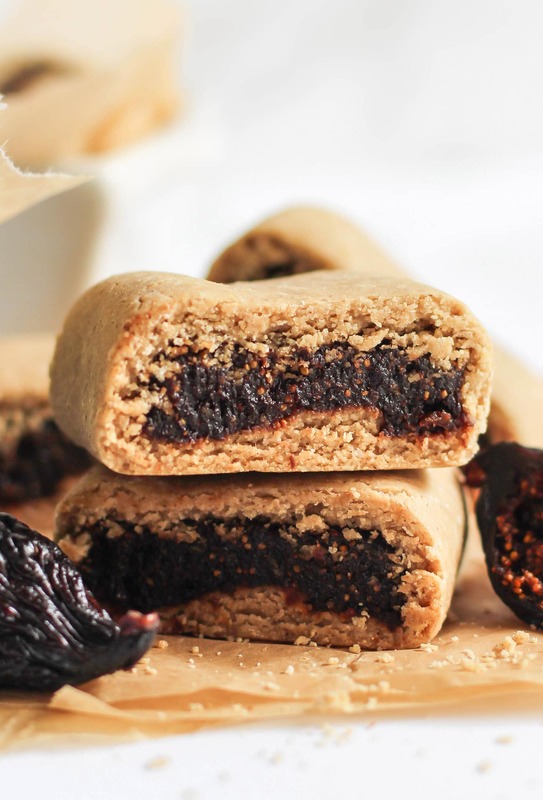 These gluten-free Fig Bars are actually very simple to make, despite looking like they took hours and hours to make. After preparing the Fig Jam (and scooping a big spoonful into your mouth for… quality assurance 😉 ) — all you need to do is mix and roll out the dough, spoon the jam on top, roll it into a log, slice, and bake! Easy peasy figgy squeezy. Right after baking, these Fig Bars are pretty firm. But after spending a night in a sealed container, DANG MA, they’re super soft and chewy and TO. DIE. FOR. 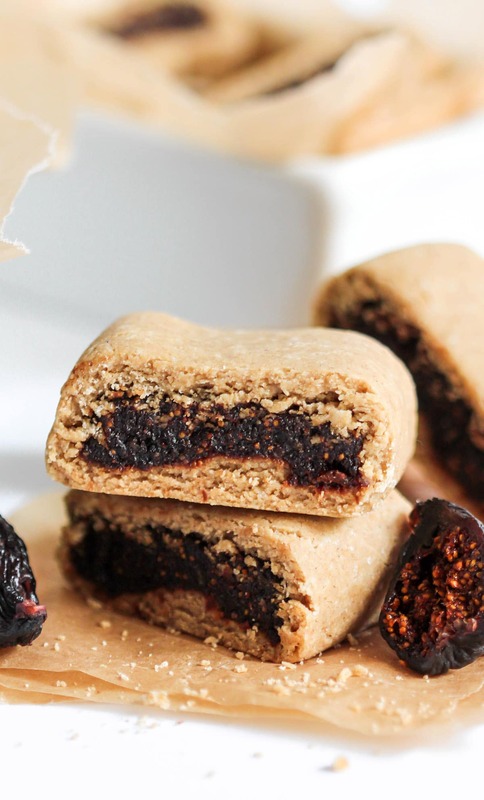 This Fig Bar recipe is better than store-bought! Best of all, you’d never know these large and hearty figgy slices are healthy, gluten free, and vegan, with no sugar added! In a small saucepan (use a wide and shallow one, not a tall and narrow one), add the dried figs, Truvia, orange juice, and water. Let soak for 1 hour. Cover with a lid and place the saucepan over medium heat. Keeping cover on, cook for ~20 minutes, or until the figs are super soft and can be easily mushed with a fork. Let cool completely. Blend in a high speed blender (I used my Vitamix) until a spreadable paste. In a medium-sized bowl, whisk together the oat flour, Truvia, baking powder, cinnamon, and salt. In a large bowl, whisk together the applesauce, the melted 2 tbs of coconut oil, water, and vanilla extract. Dump the dry ingredients into the wet ingredients and stir together until it forms a thick dough. Roll the dough out between two silicone baking sheets until ¼” thick. Slice into a large rectangle (about 8” x 18” long). Spread the fig jam in a center line down the dough rectangle. Fold the dough over the fig filling like a pamphlet. Start by lifting one side of the silicone baking sheet, gently pressing on it so the dough sticks to the fig filling, then repeat on the other side. Flip the Fig Bar “log” so the seam side is down, then slice. Place the silicone baking sheet on a cookie sheet and space the Fig Bars apart a couple inches or so. Bake for 12 minutes. Take the pan out of the oven and brush the melted 1 tsp of coconut oil on top of the bars. Let cool, then store in a tightly sealed container overnight so they can soften. Enjoy the following day! The Fig Jam recipe makes 2 cups (550g) total. You need 1 cup to make the Fig Bars. The Fig Bar recipe makes 12 Fig Bars. They're LARGE! One is probably equal to 2-3 store-bought Fig Newtons. To make these gluten-free, I used a base of oat flour, bound together with a little bit of applesauce, coconut oil, and water, and lightly sweetened with Truvia. To make the Homemade Fig Jam, all you need are 3 ingredients: figs, orange juice, and Truvia! So I recently became the owner of 3 bags of figs thanks to an Instagram giveaway and I have to thank you for giving me inspiration with this recipe for something to make those figs with! I really like fig bars so this might be a fun experiment for me to try. Fingers crossed it goes well! I’ll let you know if I give it a go. 🙂 I really want to try it! Hi Jess, what’s the baking temperature for these? Thanks! Hi Jess, what’s the baking temperature on these? Thanks! Can you use fresh figs instead of dried? I have a fig tree in my backyard and would like to skip the drying process, if possible. Thank you. OMG! I have always loved fig bars. They are absolutely glorious. Your recipe looks EXACTLY like the real product, but the filling looks even more fresh and vibrant. I bet they taste sweeter and more delicious too! YUM!!! I’m going to have to try this recipe this weekend and get back to you. Thanks for sharing!!! Are there possible substitute for Stevia with this recipe? I haven’t tried it, but sure, I don’t see why not! If you use a granulated sweetener (like coconut sugar, evaporated cane juice, erythritol, etc. ), you’d need to double the amount called for in the recipe: 2 tbs in the jam, 6 tbs in the dough.